Line a baking sheet with aluminum foil and non stick cooking spray. Place ice and cold water in a large bowl, large enough to hold saucepan. Mix the sugar, corn syrup and water in a medium saucepan over high heat. Stir until the sugar is completely dissolved. Continue to cook for approximately 10 to 20 minutes. Prevent crystallization by occasionally wiping down the sides of the saucepan. Remove the pan from the heat and immediately immerse the bottom in the prepared ice bath. Once the bubbles have stopped rising from the mixture, begin dipping the strawberries into the mixture and let excess drip off the end. Place on the prepared baking sheet. 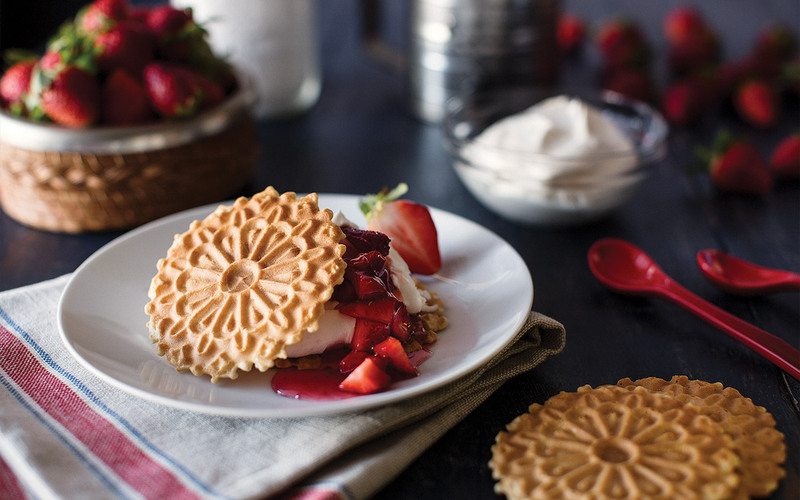 Add whipped cream to Reko Pizzelle of choice and top with candied berries. Enjoy!